Offering the largest in-stock selection of ready-to-use portable utility buildings in all of South Georgia, Daniel Aluminum Co. carries quality products from top manufacturers. Thrifty Portable Buildings offer buildings starting as small as an 8 x 8. Handi-House line offers quality greenhouses. Constructed with heavier gauge siding than any other line of portable buildings, these storage buildings are perfect for that customer who has immediate storage needs. These buildings can also be used for office units, businesses or extra room on your house. In many cases, our staff can deliver and set-up the building the same day of the sale. Additional options include double doors, 8' ceiling heights, garage doors, deadbolts, custom sizes and doublewides. While our select group of manufacturers offers a wide range of storage building sizes and styles, customers don't have to opt for a cookie cutter building or a product from our onsite inventory. We can also custom design Frame Tech buildings to be constructed on onsite in a short turnaround time. See our selection of portable utility buildings below. 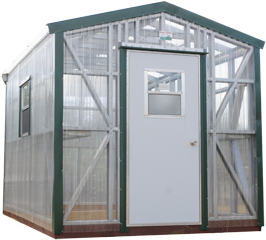 Our greenhouses are manufactured by Handi-House and come in a variety of sizes. We typically stock greenhouses from an 8x8 to 10x12 but larger sizes can be ordered. These quality greenhouses include 2x4 steel framing with a unique tinted fiberglass siding made especially for greenhouse use. 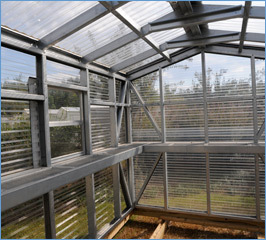 Greenhouses include shelves, lighting, electrical receptacle, a lockable door and windows. Greenhouses are also available with or without floors.